Extracta DBS is intended for molecular biology applications. This product is not intended for the diagnosis, prevention or treatment of a disease. Extracta DBS is a ready-to-use DNA extraction reagent for rapid and efficient recovery of PCR-ready DNA from dried blood spots (DBS) on Guthrie cards or Whatman 903 filter paper. This patented single-solution process produces DNA eluates that are substantially free of PCR inhibitors and compatible with a variety of end-point PCR, real-time PCR and Next Generation Sequencing (NGS) or Sanger Sequencing (1-3) reagents. Application of Extracta DBS with PerfeCTa® qPCR ToughMix or PerfeCTa MultiPlex qPCR ToughMix enables accurate and reproducible quantification of DNA sequences in blood using TaqMan® hydrolysis probe real-time qPCR. Extracta DBS is the perfect match with Quantabio ToughMix for sensitive and precise target quantification. The crude extraction combined with ToughMix, a Quantabio master mix that is tolerant to common PCR inhibitors, results in higher DNA yields independent of DNA sample inputs and qualities to enable accurate detection and high sensitivity even with low copy targets. Low amounts and quality of DNA recovered from dried blood spots commonly restrict the utilization of DNA. To overcome these limitations, Extracta DBS increases the yield and quality allowing for efficient and reliable recovery of DNA from dried blood spots. Manufactured under stringent ISO 13485 standards, Extracta DBS ensures uniform lot-to-lot performance resulting in reliable reproducibility in combination with Quantabio ToughMix. 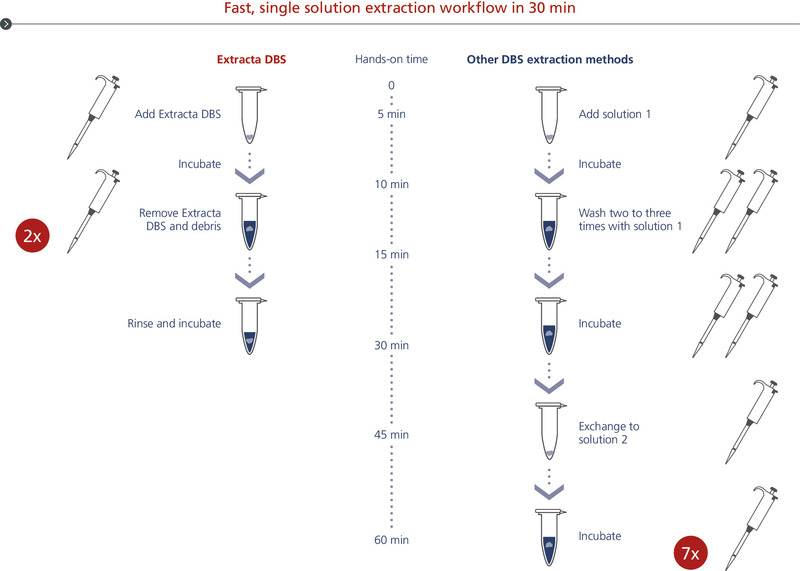 Extracta DBS DNA extraction from dried blood spots workflow. PCR-ready DNA is eluated from dried blood spots with less handling in 30 minutes. 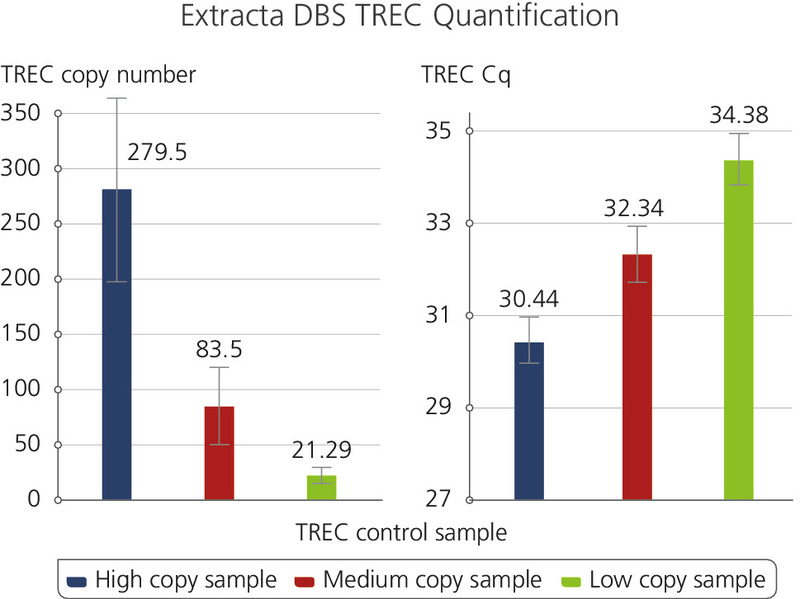 This figure demonstrates consistent lot-to-lot performance in a TREC quantification assay using genomic DNA extracted from dried blood spots. 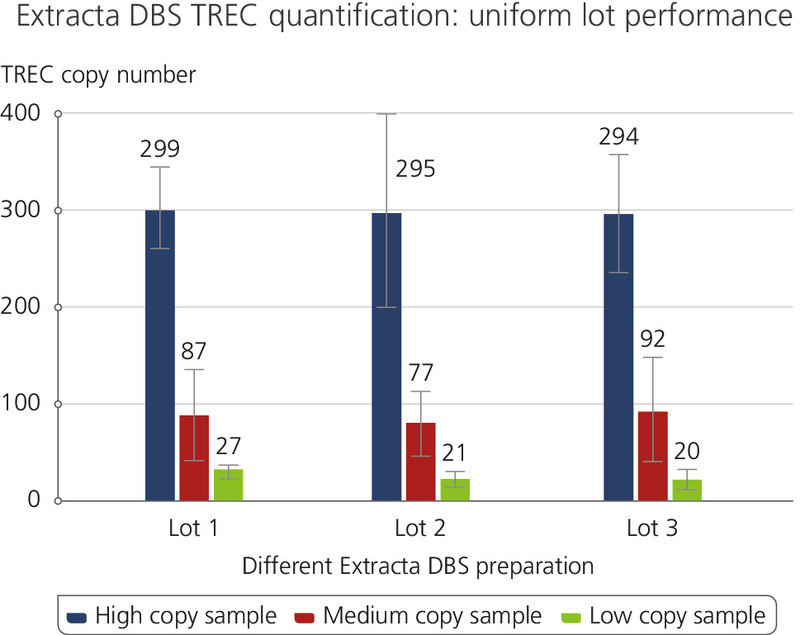 Lot-to-lot performance was tested for High, Medium and Low copy number TREC samples. The results highlight the reliability and reproducibility across various product lots which are attributed to Quantabio’s high manufacturing and production standards under ISO 13485. Illustrates the results of a T-cell Receptor Excision Circles (TREC) Assay using Extracta DBS and PerfeCTa ToughMix. Samples were generated using dried blood spot punches following the Extracta DBS protocol and used subsequently for quantification of T-cell Receptor Excision Circles. The samples are representatives of High, Medium and Low TREC copy numbers along with the corresponding Cq values. The simple and elegant way to unlock genetic information"
Extracta DBS is stable for up to 2 years at 2-8°C. Please consult the product box label for expiration date information.